The inner cell mass, the embryoblast, begins to transform into two distinct epithelial layers just before implantation occurs. The epiblast is the outer layer that consists of columnar cells.The inner layer is called the hypoblast, or primitive endoderm, which is composed of cuboidal cells. As the two layers become evident, a basement membrane presents itself between the layers. The final two layers of the embryoblast are known collectively as the bilaminar embryonic disc as well as the bilaminar blastocyst or bilaminar blastoderm. This bilaminar blastocyst also defines the primitive dorsal ventral axis. Blastocyst implantation will occur during the second week of fetal development in the endometrium of the uterus; the epiblast is dorsal and the hypoblast is ventral. The zygote undergoes cleavage as it journeys from the oviduct to the uterus. As it transforms from 2 to 4 to 8 to 16 cells, it becomes a Morula. During these divisions, the zygote remains the same size, only the amount of cells increases. The morula differentiates into an outer and inner group of cells: the peripheral outer cell layer, the trophoblast, and the central inner cell mass, the embryoblast. The trophoblast goes on to become the fetal portion of the placenta and related extraembryonic membranes. The epiblast and hypoblast arise from the embryoblast and later give rise to the embryo proper and its affiliated extraembryonic membranes. Once the zygote has differentiated into 30 cells, it starts to form a fluid-filled central cavity called the blastocyst cavity (blastocoele). This cavity is essential because as the embryo continues to divide, the outer layer of cells grows very crowded and they have a tough time gaining adequate nutrients from surrounding fluid. Therefore, the blastocyst cavity serves as a nutrient center and the fluid is able to reach and feed cells so that they can continue growing and dividing. The embryo is called a blastocyst at about the 6th day of development once it has reached nearly 100 cells. Once this has happened, the embryo begins its journey through the uterus to start implanting in the endometrium. The zygote first transformed into a morula through cleavage and then more divisions lead to a blastocyst that consisted of just a trophoblast, and an embryoblast. By the end of the first week, the embryoblast has begun separating into two layers: the epiblast and hypoblast also called the primitive endoderm. At the embryonic pole of the blastocyst, the amniotic cavity finds a home between the epiblast and the trophoblast. The epiblast stretches to surround the cavity very quickly and this layer of the epiblast becomes known as the amnion, which is one of the four extraembryonic membranes. The rest of the hypoblast and epiblast, not including the amnion, is what contributes to the bilaminar embryonic disc (bilaminar blastoderm/blastocyst), which sits between the amniotic cavity and the blastocyst cavity. The embryo proper and extramembryonic membranes are later derived from the embryonic disc. Beginning on day 8, the amniotic cavity is the first new cavity to form during the second week of development. Fluid collects between the epiblast and the hypoblast, which splits the epiblast into two portions. The layer at the embryonic pole grows around the amniotic cavity, creating a barrier from the cytotrophoblast. This becomes known as the amnion, which is one of the four extraembyonic membranes and the cells it comprises are referred to as amnioblasts. Although, the amniotic cavity starts off small it eventually grows to be larger than the blastocyst and by week 8, the whole embryo is encompassed by the amnion. The formation of the chorionic cavity (Extra-embryonic coelom) and the yolk sac (umbilical vesicle) is still up for debate. The thought of how the yolk sac membranes are formed begins with an increase in production of hypoblast cells, succeeded by different patterns of migration. On day 8, the first portion of hypoblast cells begin their migration and make what is known as the primary yolk sac, or Heuser's membrane (exocoelomic membrane). By day 12, the primary yolk sac has been disestablished by a new batch of migrating hypoblast cells that now contribute to the definitive yolk sac. While the primary yolk sac is forming, extraembryonic mesoderm makes its way into the blastocyst cavity to fill it with loosely packed cells. When the extraembryonic mesoderm is separated into two portions, a new gap arises called the chorionic cavity, or the extra-embryonic coelom. This new cavity is responsible for detaching the embryo and its amnion and yolk sac from the far wall of the blastocyst, which is now named the chorion. When the extraembryonic mesoderm splits into two layers, the amnion, yolk sac, and chorion follow its lead and also become double layered. The chorion and amnion are composed of extraembryonic ectoderm and mesoderm, where as the yolk sac is made of extraembryonic endoderm and mesoderm. When day 13 rolls around, the connecting stalk, a dense portion of extraembryonic mesoderm, restrains the embryonic disc in the chorionic cavity. 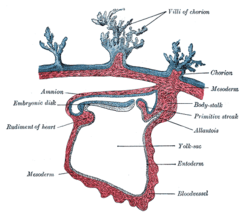 Like the amnion, the yolk sac is simply an extraembryonic membrane that surrounds a cavity. Formation of the definitive yolk sac happens after the extraembryonic mesoderm splits, and it becomes a double layered structure with hypoblast-derived endoderm on the inside and mesoderm surrounding the outside. The definitive yolk sac contributes greatly to the embryo during the 4th week of development and it executes critical functions for the embryo. One of which being the formation of blood, or hematopoiesis. Also, Primordial germ cells are first found in the wall of the yolk sac. After the 4th week of development, the growing embryonic disc becomes a great deal larger than the yolk sac and its presence usually dies out before birth. However, seldom will the yolk sac remain as deviation of the digestive tract named Meckel's diverticulum. The third week of development and the formation of the primitive streak sparks the beginning of gastrulation. Gastrulation is when the three germ cell layers develop as well as an organism’s body plan. During gastrulation, cells of the epiblast, a layer of the bilaminar blastocyst, migrate towards the primitive streak, enter it, and then move apart from it through a process called ingression. On day 16, epiblast cells that are next to the primitive streak experience epithelial-to-mesenchymal transformation as they ingress through the primitive streak. The first wave of epiblast cells takes over the hypoblast, which slowly becomes replaced by new cells that eventually constitute the definitive endoderm. The definitive endoderm is what makes the lining of the gut and other associated gut structures. Also beginning on day 16, some of the ingressing epiblast cells make their way into the area between the epiblast and the newly forming definitive endoderm. This layer of cells becomes known as intraembryonic mesoderm. After the cells have moved bilaterally from the primitive streak and matured, four divisions of intraembryonic mesoderm are made; cardiogenic mesoderm, paraxial mesoderm, intermediate mesoderm and lateral plate mesoderm. After the definitive endoderm and intraembryonic mesoderm formations are complete, the remaining epiblast cells do not ingress through the primitive streak; rather they remain on the outside and form the ectoderm. It is not long until the ectoderm becomes the neural plate and surface ectoderm. Due to the fact that an embryo develops cranial to caudal, the formation of ectoderm does not happen at the same rate during development. The more inferior portion of the primitive streak will still have epiblast cells ingressing to make intraembryonic mesoderm, while the more superior portion has stop ingressing. However, eventually gastrulation finishes and the three germ layers are complete. 1 2 3 4 5 6 7 8 9 10 11 12 13 14 15 Schoenwolf, Gary C., and William J. Larsen. Larsen's Human Embryology. 4th ed. Philadelphia: Churchill Livingstone/Elsevier, 2009. Print. 1 2 "Bilaminar Embryonic Disc." Atlas of Human Embryology. Chronolab A.G. Switzerland, n.d. Web. 27 Nov. 2012. <http://www.embryo.chronolab.com/formation.htm>.